“Music was my first love, and it will be my last”- John Miles. con le mie descrizioni tecnico/emotive delle sensazioni che provo quando ascolto questa musica. Spero di riuscire a farlo anche con questo blog. Hi to all who read me! Since the progressive (omen nomen!) internationalization of both Veruno 2 Days Prog +1 Festival and my blog, also this post will be in English language... and maybe all the future ones! 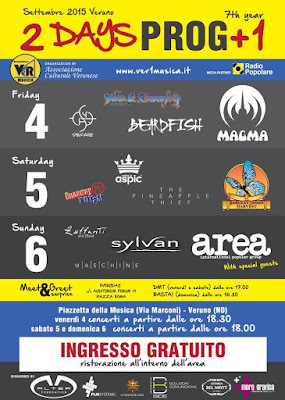 The latest edition of Veruno 2 Days Prog + 1 had two lineups, because of the forced defection of the great italian sunday headliner Banco Del Mutuo Soccorso, caused by a cerebral hemorrhage occurred to the great composer and keyboard player Vittorio Nocenzi. Luckily now he is fastly getting better and this is what really matters... isn't it? 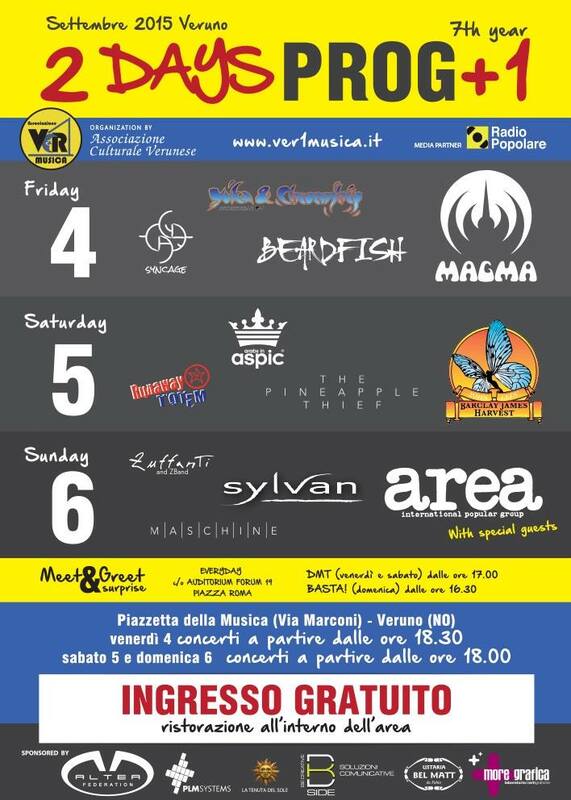 The true lineup you will always find in the annals of the Veruno Prog Festival 2015 is the one you can see on the left, with the brilliant band Area in the place of BMS. To confirm the internationalization process of the event (please notice... ALL FOR FREE) organized by Alberto Temporelli, with the collaboration of a lot of local sponsors, this year on stage we have seen and listened to bands coming from Italy, Germany, England, France, Sweden, Norway and.... JAPAN! Even the audience was mixed up with people coming from different places on Earth, so it was necessary to let them understand the introduction of the bands, which has been reported in Italian and English language by a brilliant and extroverted Octavia Brown. 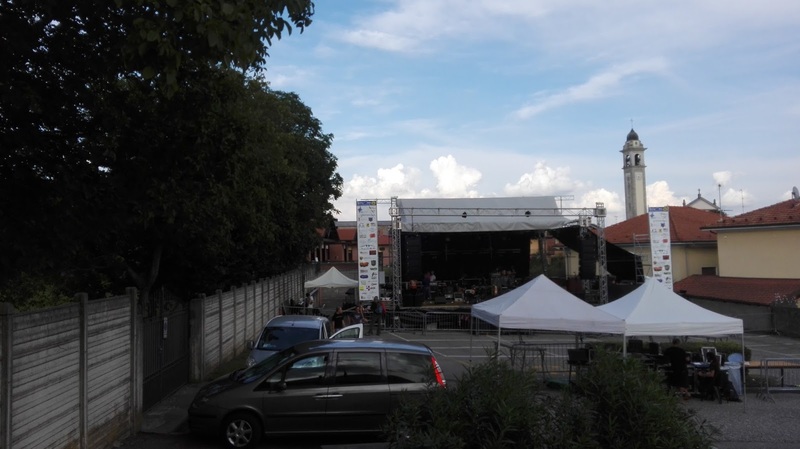 In spite of the weather forecast, predicting heavy rain on friday, we had fine weather with some rain, but always out of the time of music performances... so good!!!! Alberto Temporelli uses to say: "Veruno is always brightened by the Music Sunshine" and sometimes I imagine he has some important friendship above the sky! Now let's become serious (you know who I am and how I usually behave) and talk about the bands which succeeded on stage day by day. The sum of the ages of this young italian band from Vicenza doesn't reach my age! Real talented musicians, they all are multinstrumentalist. As you may imagine, it's very difficult to be the first band opening such a convention, but they are quite sure of their skills! Their sound is full of energy and contaminated by different musical influences, sometimes hard rock, sometimes jazzy, and they also use trumpet in their compositions, which is not so usual in this kind of music. Their singer/guitarist is very communicative, high toned in timbre and a proficient guitar player. I think they are a real promise for the future! At the moment they have only an EP out. Yuka's eyes, her sweetness and pleasantness conquered the whole audience! You may think they're an instrumental keyboard driven prog band, but this is not 100% true. The guitar player Takashi Miyazawa is really great, his solos find a large place in the compositions and are intense and rich with feeling. Yuka & Chronoship music is a mix of symphonic and jazz rock, with some influence of New Age atmospheres, especially when Yuka performs her trills with her mystical voice. The audience approval has been total, since their merchandise has been literally stormed by fans! They have 3 album out and the 3rd was presented in Italy for the first time in Veruno. Surely one of the true revelations of this edition! Yuka & Chronoship members stayed at Veruno Progfest also the day after their performance, kidding and smiling with people and the other musicians, almost as they were italian people! Really great musicians and nice persons! Beardfish is one of the most well known bands in nowadays Prog landscape. Their sound is a bit different from the other prog bands from Northern Europe, because of their warmer attitude. Unfortunately the singer Rikard Sjoblom (also guitar and keyboards player) was a bit down with his voice, but this band has really a good sound, heavy personality on stage and great experience. They played songs from their 8 albums discography, passing through their different moods, from the heavy prog of the early days to the more melodic one of their latest +4626 - Comfortzone. Really appreciated by the audience they left the stage under crowded applauses. Only one thing I didn't understand... why the Hammond Organ was put in the center of the stage obstructing the visuality for those who weren't in the center of the crowd (also those who were in the center couldn't see the drummer!)?. Unintelligible choice! Along awaited and desired, Magma's presence has collected a great number of fans of this 45 years old visionary band headed by the drummer Christian Vander. The opening song 'Kohntarkosz' really surprised me for the great drumming impact and the fantastic vibraphone job performed by Benoit Alziary. Great example of wonderful melting of jazz, rock, opera and don't know what else! The band has surely great musicians and I've noticed the great talent of the bass player Philippe Bussonnet. The subsequent part of the performance, though I appreciated the single attitudes of the instrumentalists (and also the harmonization of the three voices), didn't give to me more emotions. Maybe it's because of the vocal ostinatos which lasted all the long songs, almost like a mantra (and maybe it was! ), while the only variations seemed to be on the drums and sometimes on the bass. Far away from the "I-Ao-Za-I-Za-O-Ma-I-Ma-O-Ta-I-Ta-O Now" mantra coming from Planet Gong, where the music contribution seems to me really astonishing! OK. They are part of the history of modern music, they are really unusual and great musicians, but this is not a good reason to let me say "I like it" without being truly sure of what I say. I prefer to attract the possible disapproval of some pompous musical reviewer and of their fans (sometimes they both force their approval only to show their wide and unusual music knowledge, sometimes in bad faith), but I prefer to say what I really feel about! Furthermore, I took some impressions about their performance immediately after the show and most of the people was in accord with me. Maybe some of them will change idea tomorrow "only to show... etc. etc. ", but we know this is often one of the bad habits of prog people! Immediately after the band performance it came a rainstorm which forced us to take the way home. Maybe also Temporelli's above sky friends were a little bored! While Magma seem to be fully immersed in their mysticism, the Runaway Totem seem to take their own with more hilarious mood. If you only think about their name... there's nothing more stable than a Totem fixed in the ground, so how could it run away? Under their mystic concept that the Runaway Totem musicians exist since the beginning, but they show themselves only when another has completed his function, they propose great music, in my opinion more interesting than Magma one. They mix together tribal or complex rythms , with a vocalism sometimes very near to Demetrio Stratos (Raffaello Regoli is a singer who studied Stratos' attitude and teaches it in musical school courses), but also electronic music and large amounts of harmonic and melodic components. I have to admit I had never heard before of them, but I was surprised since I heard their music during my partecipation at Radio Tempi Dispari (www.radiotempidispari.net) for the Veruno Progfest launch night episode! They have 9 albums since 1993 and though this is not pretty my preferred kind of music, surely they need in-depth analysys! The second true revelation of this edition. I still can't forgive myself to have gone to have dinner during their performance, so I lost a part of it. The problem is that I remembered the night before, when to be present to all performances I risked to starve down the grass! Great vocal harmonization (never dropping tone), good energy, music skill and a good amount of feeling are the characteristics of this band made by members as mad as the maddest madcow! During their stay at Veruno they fraternized with ANYONE!! I've seen them talking, dancing and singing with every single person passing near their desk, also with Yuka Funakoshi and her band, who doesn't know a single English word... let's imagine Norwegian ones! Really cheerful guys! Who says that Norwegian people is cold? The following two bands I unite together for joking, under the tag "Sanremo Moment"
You know Sanremo Festival is the Festival of the Italian Song, that is italian easy listening music festival. I have to be honest... in the past someone gave to me their discography in MP3. I listened here and there some tracks but I never felt interested by their music. Now that I've had the chance to see them live, I know why. Too easy to my taste! The first song they played sounded like George Michael's 'Last Christmas'. The others were too easy, flat and poorly executed. The lowest moment of the whole festival, to my opinion. Fabio Zuffanti is one of the most prolific musicians in Italy. He is involved in several projects (most of all of his own creation) like: Hostsonaten, Finisterre, Z Band, Maschera di Cera and so on. He is well known in the whole world as one of the RPI renaissance authors. To be honest I don't like his whole musical production and I prefer Hostsonaten and Z Band to other projects, but there are also some excellent moments of great music jumping here and there in all of his works. We can say that Zuffanti's music is the prototype of RPI, but with some fusion contributions, italian popular music and foreign influences (Arabic, Indian music and so on). To celebrate his 20 years carreer, Zuffanti has created the Z Band, composed by important musicians of the italia prog scene as Giovanni Pastorino (keys), Simone Amodeo (guitars), Paolo Tixi (formerly drummer of Il Tempio delle Clessidre) and the great Martin Grice (sax and flutes, member of the legendary Delirium) and has toured through the whole world, proposing revisited and actualized songs from his multiple projects and from his latest interesting work La Quarta Vittima. At the end of his performance, for the last song 'La Notte Trasparente', he has called as guest on stage Alessandro Corvaglia, formerly singer of La Maschera di Cera, now with Delirium and other projects, who has sung with his usual intense and inspired vein. Maschine is a band composed by young english people. Luke Maschin is the founder (from his surname the name of the band). He's such a talented guitarist who played also with The Tangent and It Bites. You know I'm not a great follower of Prog Metal (with the exception of Riverside and few others), so I'm the last who can give you informations on this band. To my opinion their harmonic structures and melodic concepts are quite good and show several nice ideas, but, among the other things, maybe it could be important to remember to the drummer what Bill Bruford stated in his autobiography: "you can identify a good drummer from the pauses"
What you can listen in the studio album is really different to what they proposed on stage, where sound confusion and drumming excesses disturbed the whole performance, in my opinion. Typical German prog band: all fine musicians, good harmonies and melodies, but musically academic and a bit predictable. Their neo-prog music is quite similar to Marillion atmospheres, with great guitar moments and catchy melodies, but I didn't find any surprising moment, no shiver. I've noticed that the powerful singer Marco Gluhmann was a bit forced in high tones, so he had dropped several times, maybe for technical problems due to the monitor spy, since in the albums he is very clever and appreciable, as you can listen in the following track. Not my cup of tea, but listenable after all. I've seen Area a couple of times in a few time and their performance is alwasy relaxed, cheerful, highly inspired, politically and socially active and technically exemplary. Since Demetrio Stratos departure they avoid to exhibit with other singers, but their music lingers on fresh, always new and emotionable. I can say I've been lucky to see them still with Ares Tavolazzi on the bass the preceding time. Now he decided to stop his contribution to the band. Their sound is enriched with jazzy and electronic music contributions, killer bass patterns and the incredible work of Patrizio Fariselli on the keyboards and Paolo Tofani on guitars. They use to talk with the audience during the performance, to explain the origin of the songs, tell stories and anectodtes or simply discuss and joke among them! Really great musicians, great persons and great band! The Area incredible performance closed the Veruno 2 Days Prog + 1 in emotional and moving crescendo. Then there was the melancholic kisses and embraces, hand tights and the quick getaway. Tomorrow the whole of us would have to come back to everyday life. At the end what can I say? Surely I can't say to have listened or found something really new, but I'm, happy to have tasted positive vibrations and to have known some good bands once unknown and met lots of people. During these three days this little town seems under an enchantment which lets heap love, passion, friendship and cheerfulness in such a huge amount that the musicians, when down the stage, melt with the audience chatting, smiling, embracing, singing and dancing with them! Pure joy for all! Here Arabs in Aspic members were at the Mariotti's Guitars stand, singing (please notice the completely improvised harmonization of vocalism!) 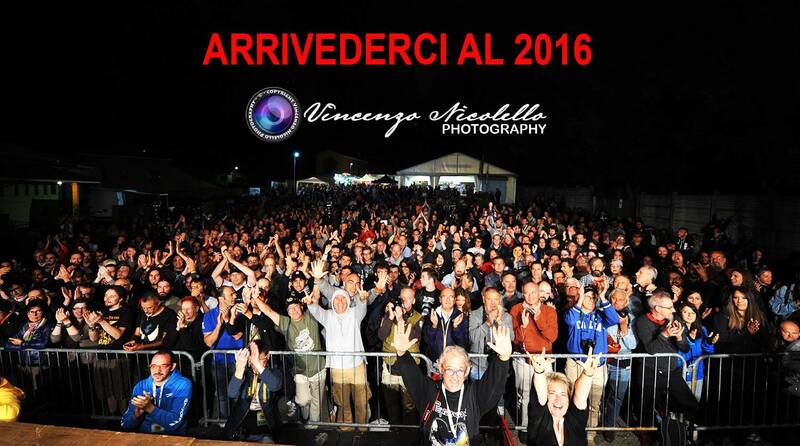 and playing, only to express their delight to be at Veruno Progfest! "Veruno has its own microclimate made of Music, Emotions, Sweetness and Energy"
It's difficult to find a better definition! So, at the end... we already are waiting for the next Veruno 2 Days Prog + 1 2016 ! One year doesn't last so long, if passed with Music! VEROODSTOCK ! Ovvero il Festival Prog più libero del mondo.